RUTLAND–Mount Saint Joseph Academy Senior Monica Schmelzenbach is the second female student-athlete at MSJ ever to score 1,000 points in basketball, after the legendary Kim Levins (MSJ ’87). 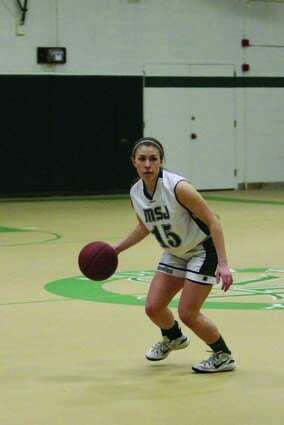 She scored her 1,000th point during MSJ’s 60-24 win over Woodstock on Wednesday night, Feb. 17. She made the basket that put her in this elite category of student-athletes during the second quarter, and the game was stopped to acknowledge her accomplishment. Schmelzenbach has excelled at MSJ, both academically and in extracurricular activities. She plays multiple sports. She is a captain of the women’s basketball team, which is the No. 1 seed in the Division IV playoffs. Monica was the goalie for the very successful MSJ soccer team. She also is a member of the track team and serves as an MSJ ambassador. Schmelzenbach has also been nominated for the U.S. Military Academy, at West Point. MSJ has a proud basketball tradition. The Mount has won state basketball championships with either its men’s or its women’s teams in each of the last four decades. This decade it has already won two basketball state titles; the women’s team won the Division IV state championship last year, while the men’s team won the Division II state championship in 2012.